The future of Tetra Pak recycling? Last week we posted a story about Tetra Pak recycling. We were disappointed to hear that plans for recycling cartons in the UK would not be forthcoming and we would still need to send cartons to Scandinavia for reprocessing. However, as we all know, there are two sides to every story. We caught up with Jenny Walden, Tetra Pak recycling officer during National zero waste week, to find out what led Tetra Pak to reach this decision. Firstly, I was reassured to hear that Tetra Pak are continually working on finding a sustainable and viable solution to recycling cartons in the UK. Along with other industries at the moment, the mill industry is suffering due to reasons including increased energy prices and foreign competition. Many mills have closed during the recession and the ones that have survived are focusing on their core business of paper recycling, rather than carton recycling. I now realise I’ve been a bit blinkered with my view about sending cartons to Scandinavia for recycling. I’ve been looking solely at transportation miles and not looking at the bigger picture; or what is technically known as the Life Cycle Analysis (LCA). The LCA gauges the overall environmental impact of Tetra Pak cartons from sourcing raw materials right through to end-of-life disposal. What I didn’t realise is the recycling plant in Scandinavia which Tetra Pak send their cartons to, uses predominately renewable energy. Over here, most recycling plants use fossil fuels. When you take this into account, it works out better for the environment, at this stage, even with transportation, for us to send our Tetra Pak cartons to Scandinavia for recycling. I know, I know; it’s like the moment when you discover polythene bags may in fact be better for the environment than paper ones. It takes a lot to get your head around these ideas, especially as consumers, because you don’t always get the full facts in order to make an informed choice. The long term sustainable solution is always one that benefits the environment and Tetra Pak know this. Many companies bring out new products or technologies that look great in the short term, but do not take the long term effects into account. The CFL light bulb is the perfect example. They seem great on the face of it – using up to 80% less energy than the incandescent bulb and lasting 10 times longer. What’s not to love from an environmental perspective? The trouble is, each CFL bulb contains a small amount of mercury, so what happens to that mercury in ten years time when the bulbs need replacing? We’re supposed to put them with WEEE for reclamation of the mercury, but what about the millions that find their way into landfill? The mercury will be released and who knows what the long term environmental and health effects might be? If I apply that principle to Tetra Pak carton recycling, I can understand their decision. What use is it to recycle cartons in the UK if the long term effects are more damaging than sending them to Scandinavia? Tetra Pak want to ensure that whatever recycling system they put in place has long term sustainability both for business and the environment. Tetra Pak cartons are renowned for being made from good quality, strong, clean material which in turn makes a good quality recycled end product – usually plasterboard. There is little point making an inferior quality recycled product just so we can say it is recycled in the UK! The bottom line is, Tetra Pak are doing the best with the resources they have. They know there is no quick solution. In the meantime they are working with Local Authorities to increase kerbside collections and are having meetings with companies to try and find a UK- based solution. Create demand! By using and recycling Tetra Pak cartons, you show that recycling in the UK is a viable option. Ask your Local Authority and / or Tetra Pak to provide recycling facilities in your area. Recycle efficiently – washing and squashing cartons means three times more containers fit into recycling containers and collection vehicles. This reduces overall transportation and environmental costs. Paperboard, which makes up 75% of cartons is sourced from managed forests. Under their Design for Environment program, Tetra Pak are improving the environmental profile of their packaging. By using European mills, Tetra Pak are not only able to ensure the material is recycled, but they know what it is being recycled in to. If we, as consumers, can show potential business in the UK that there is the demand, we might just get the technology we need to recycle cartons over here. So the message is keep using Tetra Pak cartons and don’t forget to wash, squash and recycle! Tetrapaks also use aluminium combination (waste) which is incinerated in Sweden to form the oxide. This aspect is one reason for my avoidance of this otherwise versatile package. I mentioned this to Jenny but feel that this will not be addressed immediately, maybe longterm. As for the recycling process, a central location for production suits their business plan so centralising recycling to Sweden makes sense. Local Authority pick-up would be very sensible due to Tetrapak’s large volume of sales. The last thing we need is a landfill/EfW destination for the mostly recyclable packs. The Swedish company should finance this return process. Scandinavia is not that far away in global transportation terms. It’s not like shipping plastic pellets to China. I guess the one thing we must always keep in mind is that we must take a complete snapshot of all the processes that make up the life cycle of any product. Sure, it’s preferable to do all our own recycling and take care of all our own waste issues In the UK. However, as this article points out, Scandinavian recyclers use power from renewable sources and not fossil fuels. Maybe that does tip the balance in favour of exporting the recyclate. It is clear that using Tetra Paks is still one of the best environmentally friendly options and the more we use them, the greater the chance we will see an eco-friendly recyling plant here in the UK at some point. We engage with folk daily on this complex but perfectly rational subject (another in-store demo scheduled for tomorrow) also describing the difference between properly accounting for carbon oututs via an ethical carbon balancing programme rather than the ‘future credits’ trading system favoured by some companies. I’m still not convinced about the tetrapaks – have checked out their websites, and after A LOT of clicking, a lot of prettified ‘burnspeak’ appears! Beware of the ‘prettyspeak’ ‘recycled to energy’ (=WtE) in addition to ‘materially recycled’! (not sure if I got the right words, mainly extrapolating from our websites..) so ask them to be specific, what EXACTLY happens with the tetrapaks and individual ‘ingredients’..
What I wonder is: exactly how much is ‘materially’ recycled (not WtE) and how much ‘waste’ remains and is then landfilled or incinerated/plasma-fied/pyrolised, have they told you? @Layla: Plasma gasification is a better alternative to EfW in that waste output is non-toxic, producing only a vitrified residue. It can deal with municipal waste, the biggest problem we have. Like Anaerobic Digestion this is a renewable sustainable system. There was talk of hydrogen-sulphide emission from AD plants. Layla, I think you stated that in a previous post. This ‘rotten egg’ gas can easily be treated within the system and is not a big factor. These new technologies are necessary to transform waste into resources, almost Zero Waste. @John Costigane: Hi John, it’s hard to make the right consumer decision isn’t it? All we can do is make those which feel right to us, as individuals. I feel confident Tetra Pak know about the challenges with their packaging and they seem to be working tirelessly to improve things. The idea of increasing kerbside collections is very exciting and will help the cause no end. @Neil T: Hello Neil, welcome to the site. I’ve been looking at your site and blog. I’m very concerned to see you have been around since the beginning of Jan 2008 and I’ve never heard of you 🙁 Maybe we should chat on the phone some time and you can tell me all about your company. I know plasma has some proponents even among ‘eco’ people, I’m still not thoroughly convinced of it..
Wikipedia says plasma is not ready to be used for municipal waste yet and is mostly used for toxic waste? Well, technologies do develop.. still, how sensible is it to spend a lot of energy and money making things and then make ‘glass’ out of them? Even if it were really non-toxic for centuries (which I’m sceptic of, they always say that, have you read any studies? What about earthquakes or bombs or other catastrophes – could toxics be released from the ‘glass’ then? Was it even tested? and soo many things can go wrong in these plants before the ‘glass’ is even made..) isn’t it all just a waste of resources? AD probably has its place in the scheme of things, I just think it’s important to be careful with these things.. and to monitor H2S constantly… Well-managed plants can probably operate well, we do have a biogas facility locally where at times the stench is really horrible.. So I was wondering how rigorous they are in their testing and monitoring..
How many people do you think will even bother with zero waste if you tell ’em a plasma facility can take care of all their worries? Sorry to get a bit off-topic..
Mrs Green, glad to hear you’ve had similar questions yourself – hopefully we’ll find out more about this all and be able to make better decisions for it! In our house we are now buying less juice and stuff in tetrapaks or plastic bottles, we’ve made some homemade juice and more homemade dairy products.. Personally I don’t buy any tetrapaks anymore, other family members still sometimes do, I hope more products will be offered in alternative packagings or sourced package-free.. The UK is developing both technologies, Plasma and AD, in several companies and will provide safe and reliable systems. You mentioned H2S but I have already told you that the current systems deal with this quite easily so it is really not an issue, though older systems may produce this gas. These renewable alternatives are essential since municipal waste has to be treated in some way. You cannot compare this to EfW with its toxic waste. Talking these better technologies down will simply reinforce the incinerator lobby so better to encourage sustainable developments. Zero Waste is not antipathetic to these renewables though we may have to alter our approach when plastic waste can be treated by Plasma Gas. This is still a long way off with landfill and EfW the vast majority of current waste activities, requiring the trend to reduce waste to the max. I think you ‘lesser of 2 evils’ comment is misplaced since both are renewable and sustainable, compared to EfW/landfill. Toxic waste from EfW can be processed safely by Plasma Gas, down to its non-toxic components. Surely you see some value in this? Oh John, not you too? I’m really disappointed in you to think plasma ‘sustainable’! Since when is plasma zero waste? C’mon! I know waste needs to be dealt with, the governments are going about it wrong though. They are not inspiring people or merchants/producers to go zero waste, re-think and re-design selling and buying processes, they want commissions from expensive businesses!! Hello, this is Sam from Tetra Pak. I am here instead of Jenny as she has been away exhibiting with our carton industry partners at the RWM (Recycling and Waste Management) exhibition. This is one of the largest waste events of the year and most of the UK Local Authorities and waste managers were there, so Jenny and the team were talking to everyone about how cartons can be collected from the kerbside. Thank you to Rachelle for giving us this opportunity to tell a bit more of our story. 1) In these Scandinavian countries, various types of renewable energy are used, but in Sweden, where around 52% of the energy produced is renewable, most of this (around 46% of this is Hydro energy. Source: http://www.energy.eu/renewables/factsheets/2008_res_sheet_sweden_en.pdf). 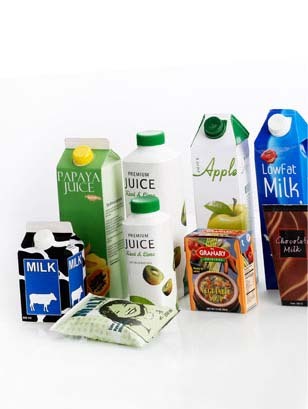 2) Cartons are recycled into different things in different countries in the world. As we mentioned in our last post on myzerowaste at http://mzw.wpengine.com/2009/06/recycling-officer-jenny-walden-from-tetrapak-answers-your-recycling-questions/ , The paperboard (which makes up around 73% of the carton and comes off as fibre pulp in the hydra pulping process) gets used to make plasterboard liner, and the plastic and aluminium (which makes up around 27% of the carton) is burned to help power the paper mill. As part of our work on UK reprocessing we would like to ensure that the aluminium and plastic, (that make up only 27% of the package) are also recycled, and continue to investigate routes through which we might do this. You will see that we need to keep on asking people to recycle their cartons so that we have a large, stable source of material, so we could viably do this in the future. I do hope this proves useful. ..
@Layla: Admittedly, Plasma Gasification is not fully established in the UK yet, though 2 companies are pioneering the technology. As an alternative to EfW, and its toxic fly-ash, I am prepared to see if it can work sustainably. Municipal waste will not disappear overnight, so we must accept the necessity of treating such waste. If the only by-product of this alternative technology is inert glass then I could accept its use. Together with green waste composting, AD, best practice recycling, sustainable packaging ( longerterm), the whole range of municipal waste would be covered. I support GAIA in its opposition to the known downsides of EfW but reserve judgement on Plasma Gas until the system is perfected here. @Sam: Hi Sam, many thanks for coming to the site to share more answers with us! It sounds like you are doing a lot to improve things wherever you can and we love hearing about all the developments. In my understanding it is actually irresponsible for companies to launch products into the market without making responsible provision for the products’ post consumer life. It would seem that Tetrapak UK sort of half make it. @Rory Short: Hello Rory; welcome to the site. I agree it is irresponsible to make products without thinking of their end life disposal. It seems tetra pak are well aware of their shortcomings and are at least looking at ways of improving heir carbon footprint. LCA of CFLs shows that the actual impact of Hg in CFLs is very low (mostly absorbed in the glass at the end of life), and there is 10 x more mercury in the emissions from coal-fired power that would have been released if a regular light bulb was used.